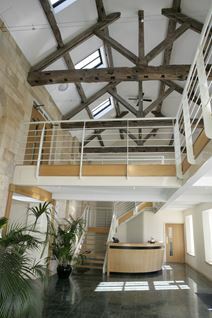 Office Space - Charlbury, Oxfordshire. On an ancient wooded estate that once housed a Royal Hunting Lodge, this innovative business park attracts a range of companies from the service and research sectors. The picturesque park is a short commute from Oxford and very close to Charlbury railway station for trains to London. The accommodation available includes a converted stable block and converted barns, all set within stunning country park with lakes and roaming deer. The offices can be used for studio work and have a quality finish for comfort and convenience.